P onche: It looks like a bubbling pot of hot fruit salad. It smells like heaven. It's a classic symbol of Christmas in San Miguel de Allende—as it is all over Mexico—and it belongs in your Christmas plans too. As the posadas wind through the streets of San Miguel, ponche is ladeled out to the "pilgrims" at the doors of the houses. A pot is always kept hot and ready for guests. The smell drifting through the house as it simmers on the stove is heady stuff indeed. There are hundreds of authentic Mexican recipes for ponche. Every Mexican cook and kitchen has its favorite variation. But all of them have a couple of things in common. First is tejocotes. This small, apple-like fruit is in season in Mexico at holiday time and it's a must for making truly authentic ponche navideño..
Tejocotes are actually the fruit of the hawthorn tree. They look a bit like a crab apple, but their sweet-sour flavor is unique. They have a beautiful color ranging from orange to golden yellow and a distinctive flavor—somewhere between a plum and an apricot. 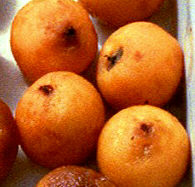 Tejocotes have a long history. The Aztecs called them texocotl and used them in a fruit preserve called texocotzopelloti. Every traditional ponche recipe calls for fresh tejocotes. In Mexico, you can find them in the market at this time of year. In the rest of North America and Europe--good luck! In the past, they were nearly impossible to find. Now you can sometimes buy them in Mexican grocery stores. Goya Foods sells bottled tejocotes. The texture is more gelatinous, but they'll work. You may also be able to order them online. If the search comes up empty, you can come reasonably close by substituting fresh kumquats or yellow plums. Two other standard ingredients in ponche recipes are fresh sugar cane and piloncillo, dark brown sugar formed into cones. These are both becoming more common in American supermarkets and specialty stores. In a medium saucepan, bring one quart of water to a boil. Add the tejocotes, lower the heat and simmer for 6-8 minutes until softened. Remove the fruit, peel and cut off the hard ends. Prepare the fruits: Peel the sugar cane and slice it into medallions. Remove the stems and cores from the pears and cut into large chunks. Cut the guavas and prunes in half. Stud the oranges with the whole cloves. Cut the cone of piloncillo into large chunks. In a very large pot (like your grandma used to use for canning), bring the remaining water to a boil. Add all the fruits and nuts to the pot and bring it back to a boil. Lower heat and simmer for one-half hour, stirring gently now and then. Add the piloncillo and cinnamon. Simmer for another half hour. Remove from heat. Ladel into cups, making sure each cup gets some chunks of fruit and nuts. Add rum or brandy to each cup as desired. Serve hot. Will make at least 30 servings. Substitutions: If you can't find piloncillo use dark brown sugar. 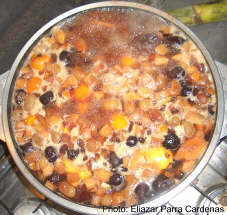 Suggestions: Ponche is an art form with almost as many variations are there are Mexican cooks. Some recipes call for apples, others pears, many use both. Many recipes will include tamarind pods. Some cooks add jamaica, a drink brewed from dried hibiscus flowers. Still others like to add pomegranate seeds. Use a little imagination, and your ponche recipe will be your own.